Had a little problem with my PSR S-910 this week end, I found out that one of the notes wasn't playing correctly. The note was A4, it would play when I first switched on the keyboard but the second time the note was played there was no sound, so I decided to take the keyboard apart to see what the trouble was. I took out all the screws from the underside of the keyboard including the two large square panels with 14 screws each panel (these have to be taken off because there are two small screws inside screwed into the upper casing). 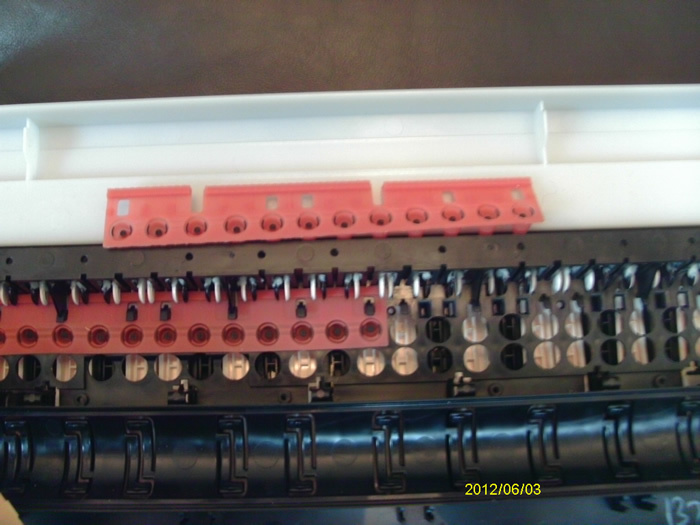 When the upper and lower casings are apart there is one screw holding the keybed to the upper case and by removing one wiring cluster the complete keybed can be removed from the upper casing. 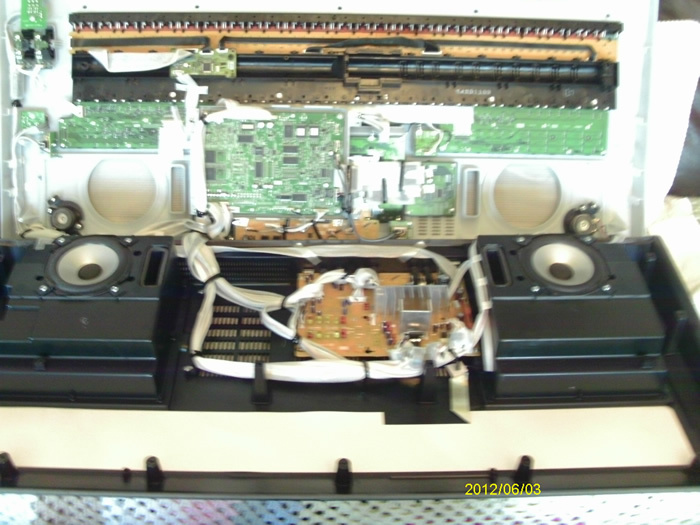 Photo 1: S910 Exposed (click on photo for an enlarged view). 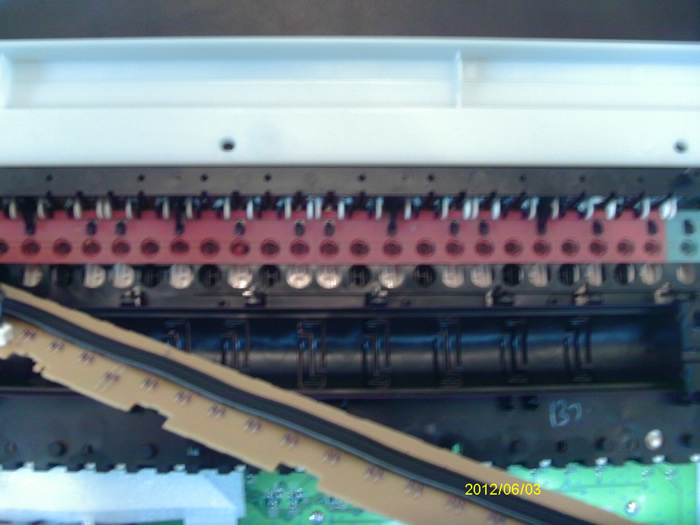 The keybed doesn't have to be removed to access the contact strips, in photo 2 you will see that there is a brown board which is held by 5 or 6 black plastic clips at the bottom of the board and by lifting the right hand side of the board gently you can pull back the clips one at a time starting from the right hand side to the left, the section of the brown board covers two octaves, the little black clips at the top of the brown board are there permanent so you will have to ease the bottom of the board towards you, see the board removed in photo 3. 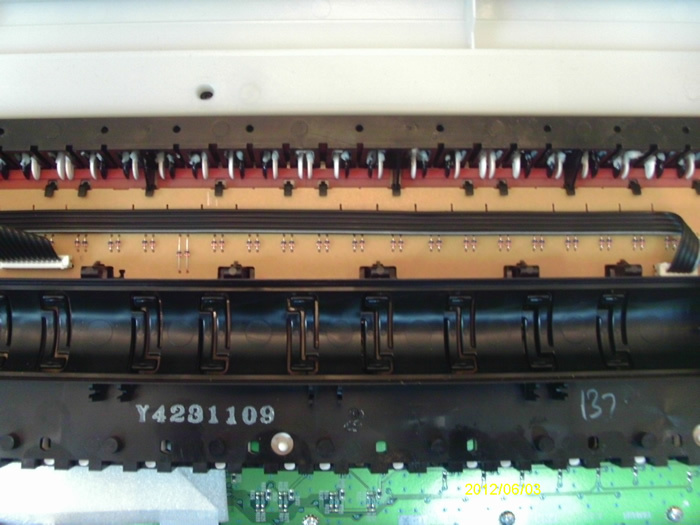 Photo 4 is showing one of the contact rubbers (there are 12 contacts there one for each note in an octave, there are 5 of these pieces of rubber for the full keyboard and the Top C has one blue one on it's own which can be seen on photo 3) the little contacts for each note are just a little lager then a pin head which can be seen in photo 4, the 12 little dimples are shaped like a top hat and when the keys are played these little black spots are pressed against the underside of the brown contact board which gives you the sensitivity touch and harmony. The problem I had with the keyboard was that there must have been a bad contact, the cure was to clean the contacts and the underside of the brown contact board with Methylated Spirits and a non fluffy piece of material. This page uMarch 23, 20192, 2019 .